Chilling out: Principal Cathy Galvin, competition winners/program founders Maya Rees, Michelle Krueger and Alicia Horsfield, and Johanna Dore, of headspace Nundah. THREE students and two therapy dogs will remind the community at St John Fisher College, Bracken Ridge, to improve their mental health with the recent launch of a wellbeing space. The new program, titled Fun, Food & Fellowship, is the brainchild of students Alicia Horsfield, Maya Rees and Michelle Krueger, who received a $5000 grant from the Goldfish Tank funding competition held by headspace Nundah and VIVA Energy. 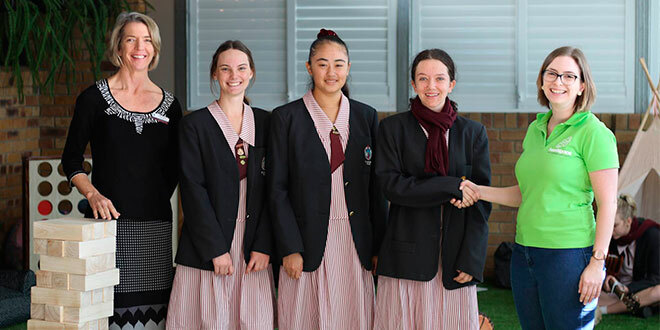 Competing against other young people aged 12‑25 from across Queensland, the girls were chosen for their youth-led health and wellbeing project that will now be brought to life at the college. Operational manager of headspace Nundah Johanna Dore commended the innovation of the St John Fisher trio. “Headspace Nundah were delighted to see an application that featured a youth-led, original idea that would benefit a school community,” Ms Dore said. The winnings will contribute towards adorning the new facility with faux grass, comfortable furniture, iPod access to a mindfulness app, headphone equipment for relaxation and “zoning out”, and an area with life-sized board games. The space will be used not only for music, books, games, food and wellbeing presentations by guest speakers, but also to enjoy the company of therapy dogs Wilbur and Lucy. “The finished product is fantastic and it’s a credit to Alicia, Maya, Michelle and the teachers and staff that helped them complete the project,” Ms Dore said. Guidance counsellor Amy Hodgkinson, who was essential to the initiation of the program, expressed her excitement for the launch. “The idea of offering a wellbeing program within the college, has been a long time coming and I am so pleased that it has now come to fruition, in the form of Fun, Food & Fellowship,” Ms Hodgkinson said. “We are grateful to headspace for the grant, that has enabled us to forge ahead with a wellbeing program that is designed by the girls, for the girls. “The teenage years can be difficult ones to navigate, and at the core, everyone just wants to fit in. “Fun, Food & Fellowship is such a special and important project to me,” Alicia Horsfield said. “The fact that it’s now real, and up and running, makes me feel so happy inside. Pastoral care assistant principal Andrew McEwan revealed his pride in the independence of the students throughout the program’s development. “The Fun, Food & Fellowship program is more than just a space, it is an ongoing wellbeing program that has been designed for the girls, by the girls,” Mr McEwan said.